For the first time, the Force isn’t part of the story. Nobody has it or speaks of it - I didn’t see any lightsabers - so this may be why Han doesn’t believe in it when we catch up with him in Episode IV. I was entertained plenty, but I still craved something more. There was nothing that I was surprised by - even a secret cameo in the third act didn’t mean much to me. Aldenreich is good in the title role, but I can’t say I really bought him as being the same character that Harrison Ford made so iconic. That’s probably because I’ve lived with Ford for forty years as the legendary scruffy headed nerfherder. A friend said that Aldenreich doesn’t look like Ford, but he looks like the character. I guess I can go with that, but it’s still hard to not think of Ford. 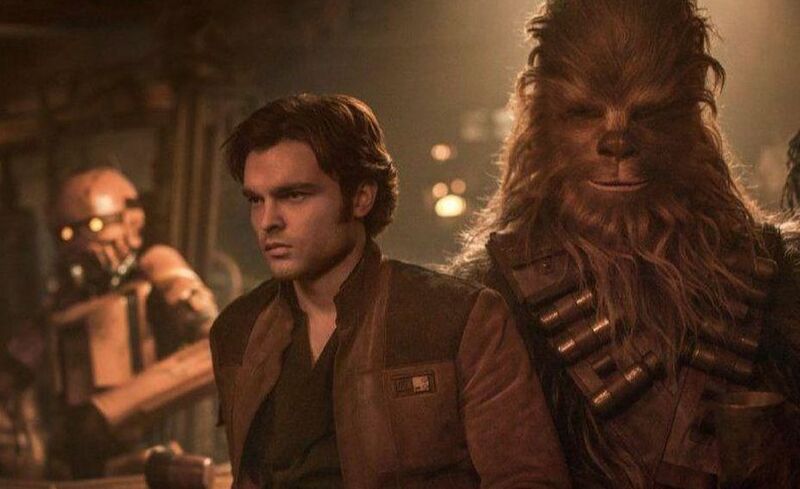 So SOLO is a predictable package that’s a passable STAR WARS STORY. The way it leaves room for a sequel is also really expected - i.e. there's no Jabba the Hut and Greedo here so that could be featured in a follow-up that’ll serve as yet another prequel to the first film. It’s obvious that Lucasfilm is planning on filling every gap in the shared universe of these narratives, so that there will be nothing left to the imagination. Separator image Posted in Alden Ehrenreich, Donald Glover, Emilia Clarke, Ron Howard, Solo: A Star Wars Story, Star Wars, Woody Harrelson.